China is leading the energy transition as the world’s largest producer, exporter and installer of solar panels, wind turbines, batteries and electric vehicles. It has a clear lead too in renewable energy patents, ahead of the U.S. and twice that of the EU. But it is also still heavily dependent on coal, the air pollution in its cities is legendary, and the economy is expected to quadruple by 2050. Against this background, Kaare Sandholt, Chief Expert at the China National Renewable Energy Centre, looks at the Chinese government’s options to meet the Paris goals. For the last 30 years, China’s strong economic growth has been accompanied by a similar strong growth in energy consumption. Access to electricity and coal has been a necessary precondition for a growth based on production of goods and for the development of the Chinese infrastructure. The economic development has brought more than 800 million people out of extreme poverty, but has also led to massive pollution of air, water and soil, enormous CO2 emission and an ever-increasing dependence of imported oil. The Chinese energy system can be characterised as dirty and high-carbon, addicted to coal and oil, and not necessarily cost efficient from a consumer point of view. In 2015 the Chinese leadership decided to change this development path. 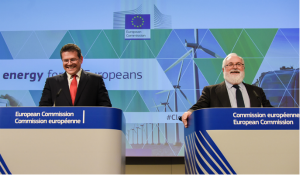 The 13th five-year plan set the target “to build a clean, low-carbon, safe and efficient energy system”. 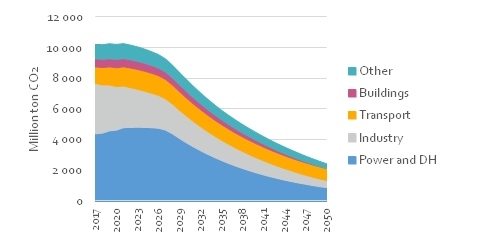 As part of the implementation of the plan, the favourable conditions for coal power plants have been lessened for new plants, planned and approved coal power projects were stopped or delayed, an effort to better integrate renewable energy was launched, and more focus has been put on development of electric cars as a long-term solution for the ever-increasing oil-dependency in the transport sector. A power sector reform was re-initiated, and an ETS system for CO2 was launched as regional and national pilots. China launched an innovation plan, China 2025, with focus on quality instead of quantity and with new technologies, including renewable energy technologies and electric vehicles as strategic emerging industries, which should form the backbone of the Chinese economy in the future. In autumn 2017, President Xi Jinping reconfirmed the long-term targets for the energy system at the 19th Communist Party Congress, and the commitment to the development of “ecological civilisation” as the main priority for China and as a precondition for a continuation of the economic development in China. There is no doubt that these development goals are taken serious in China. However, the transformation from targets to concrete strategy is not clear, and no official long-term pathway for the transformation has been established. A recent study now dives into the details of the energy system transformation and gives a concrete example on how the targets can be reached. 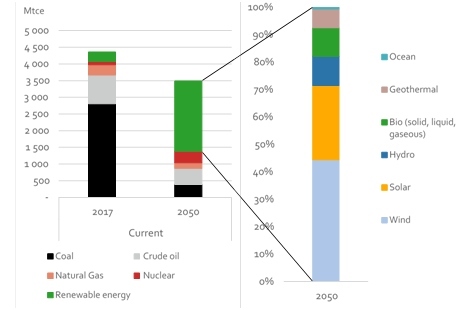 “China Renewable Energy Outlook 2018”, CREO-2018, from the China National Renewable Energy Centre in the Energy Research Institute under NDRC, presents two comprehensive energy system scenarios towards 2050. The scenarios are based on detailed model analyses, including a power system dispatch model to analyse the integration of variable energy production from renewables. 3) switching from coal to wind and solar in the power sector, as a consequence of the limitations of CO2 emission but also due to the reduction or cost for solar and wind which make these technologies competitive with coal power and much cheaper than natural gas power. 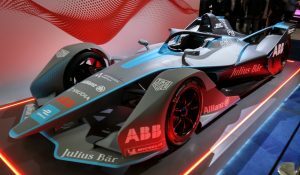 The result of these drivers is a fundamental transformation of the whole energy system, with a lower energy consumption, both the final and the primary energy consumption. The final energy consumption in 2050 is only 88% and the primary energy consumption 80% of the consumption today, despite an economic growth that will quadruple the economy until 2050. In the energy supply wind and solar become the dominant energy providers, covering 88% of the electricity production, while coal and oil are reduced significantly. The losses in the energy system are greatly reduced by the electrification in the end-use sectors and by the reduction of losses from coal power plants. 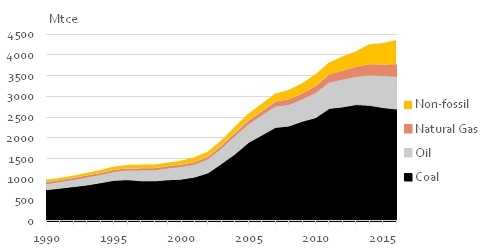 Nuclear power plants are assumed to continue to be deployed, but the potential is limited due to lack of suitable sites. Natural gas is not expected to play a big role in the Chinese energy system by 2050, because it is much more expensive than wind and solar. The impact of the energy transformation is in line with the overall targets. Compared with today the situation in 2050 is that the air is much cleaner, the use of water is much lower, the CO2 emission from the energy sector is only one third of today’s, the dependence of imported oil and gas is greatly reduced and the power production cost is lower and more robust to volatile fuel prices. 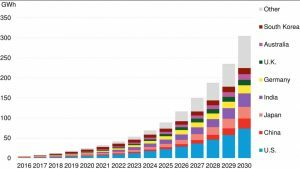 It seems that an energy transformation with focus on decarbonisation will give high benefits on all other key parameters for the sustainable energy system China wants. Even with these clear long-term benefits, the firm implementation of the development pathways is not a straightforward process. Many different interests have to be balanced against each other and the transformation process is not a win-win situation for all stakeholders. The reduction of the use of coal can be a serious hit to some of the provinces with an economy that is heavily reliant on income from the coal supply chain and/or from power production based on coal. 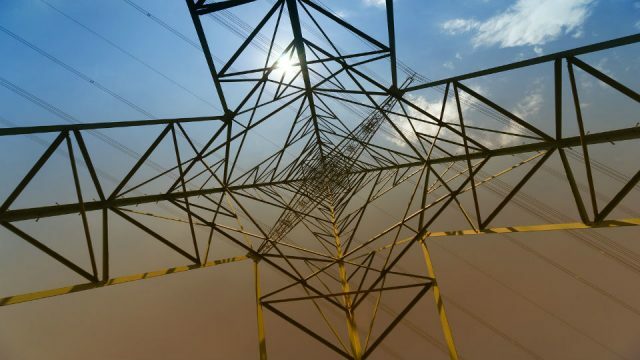 The introduction of an efficient power market, which is necessary to ensure cost efficiency and good integration of variable energy production, will threaten some of the established power producers and stranded assets will be a (necessary) consequence. The grid companies are also challenged by the power sector reform where new market players get access to the costumers. Despite of these challenges there is reason to be optimistic regarding the energy transition in China. The combination of a serious commitment from the Chinese top leadership and the strong drivers from the economic reform process gives a sound basis for the transformation. It is not a question if it will happen, but how fast it will happen. The word “safe” doesn’t apply on nuclear. Whether “clean” and “efficient” apply is a point of discussion. Considering Xi Jinping’s great authority in China, it explains the stop on nuclear by law-abiding Chinese authorities. – The requirement for cheaper electricity in 2050. As nuclear is too expensive, that target will become more difficult to reach with a substantial nuclear share. The introduction of competition regarding electricity supply, combined with decentralization, is of course also an important factor regarding the declining prospects of nuclear. – “… enabling renewable energy … to participate in spot markets as well as medium- and long-term power markets”. Anyway only coastal sites are allowed for safety reasons, which limit nuclear to 120GW (slightly more than US has). This post is completely short sighted. How exactly do you define nuclear to not be ‘safe’? Conversely it is actually one of the very safest forms of energy per GWh. I wonder if you consider dammed Hydro to be ‘safe’.. ? 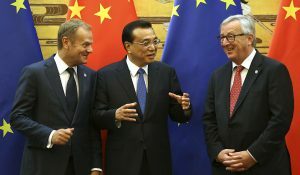 ‘As nuclear is too expensive’: Is this based on any actual figures relating to China, or just another sweeping statement? I find it quite shocking that people think it is feasible to sustain the world’s largest population – which is currently going through a level of urbanisation greater than we’ve ever seen before – with almost entirely RES and storage. Nuclear reactors for electricity production (are planned to) last ~50years. All ~500 nuclear reactors in the world operated in total 16K by UN WHO IARC and a million (Annals New York Academy of Sciences). So historic facts show that there is a chance of ~1%*) that a reactor ends in a disaster creating thousands of deaths and a large exclusion zone. I cannot call that safe. *) There was 1 disaster in 4500yrs (equals 4 in 18000yrs). So with a 45yrs reactor life period the chance that it ends in disaster is 1%. May be you can illustrate what exactly is short sighted? What is shocking about that? 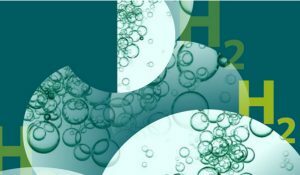 We can convert part to H² using German PtG(H²) plants (yield of ~80%), store a winter supply in deep earth caverns (as we do already with conditioned natural gas) and use it during long periods without wind and little sun (utilizing high yield fuel cells; ~80%). Those installations are normally unmanned of course. *) NL consumes 120TWh/a elektricity and ~750TWh/a fossil (for heat, transport, etc). Dutch part of the North Sea is 57,000km². Onshore is ~42,000km² incl. lakes. If we put on 20,000km² one 12MW wind turbine (e.g. Haliade-X, CF >60%) per km², those wind turbines produce >1,200TWh. Which is nearly twice what we will need because usage efficiency will increase with the conversion towards all electric.